For a smart but casual outfit for my work experience at Absolute Radio i’ve opted for what was my christmas present to myself, a maroon jumper complete with a fresh white shirt attached, from ASOS. 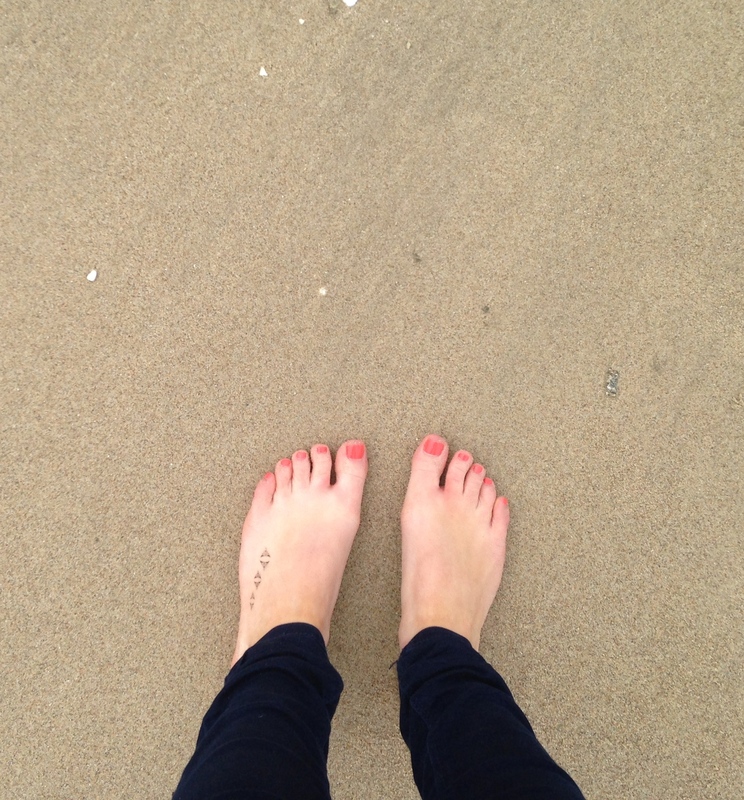 I then chose to wear my jeans courtesy of Topshop, an acid wash pair from the Leigh range. They provide a snug fit, despite the soft and comfortable material. 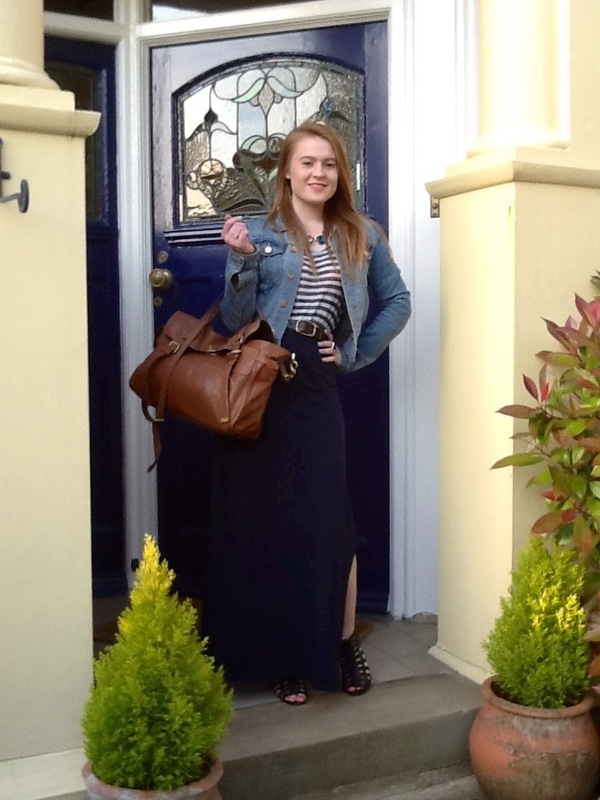 I then partnered the outfit with my new bag from River Island, you’ve gotta love an updated wardrobe after christmas! The bag is ideal, as when commuting up to London i’m not nearly knocking people out with an inconsiderate monstrosity on my back, that us short legged people hate on escalators! But this bag is spacious enough to fit in all my essentials and the contrast of black and gold makes it eye catching, adding style to any outfit. 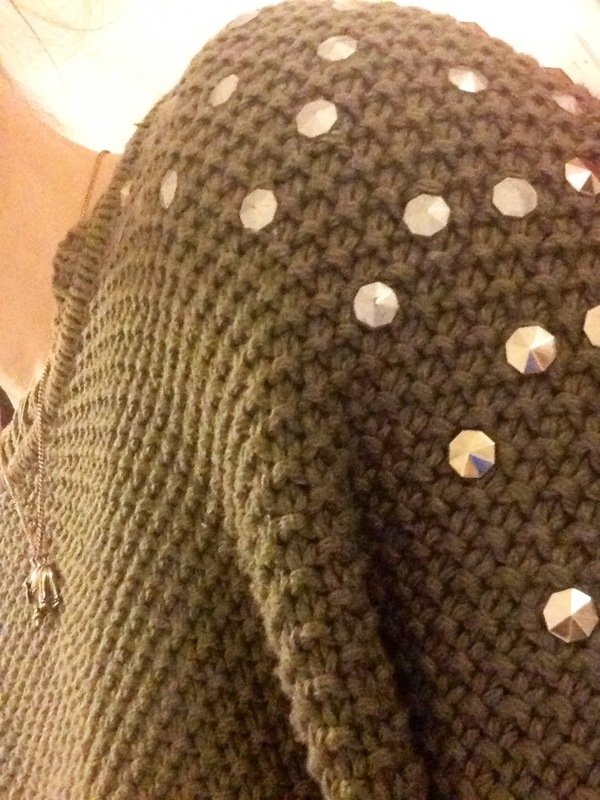 Here is the studded shoulder of my favourite Topshop Jumper from Autumn / Winter 2012. I have dragged it back out for another season, its so warm, totally oversized and snuggly – despite the studs! I have been rocking this look with skinny black jeans (ASOS) and black suede boots (Hoads), I chucked my pleather jacket (H&M) on to battle the cold and wacked out the dry shampoo (Batiste) and top knot. I recently acquired this fantastic concealer set; ‘No Show Camouflage Fix‘ from POP via asos.com from their flash beauty sale and have been loving the green redness corrector section. The green blends with your skin, changing red marks into the same colour as your skin, evening out your skin tone – great if you have problem skin or for when you get that one pesky spot just before a night out! With everything I buy, whilst i may love a brand or product, i am also a sucker for a bargain. So i am always combing the high street for a cheep version that still works, or a great offer on that product i love. For this product, whilst i cannot find a replacement that meets the standard set in being able to buy four different types on concealer in one, I have found a ‘Green Corrector Stick‘ from Natural Collection (boots.com) for only £1.99, bargain as this is the bit i use the most. Queue, me and Nicola running across to Boots after work and snapping up the last two there before they closed! 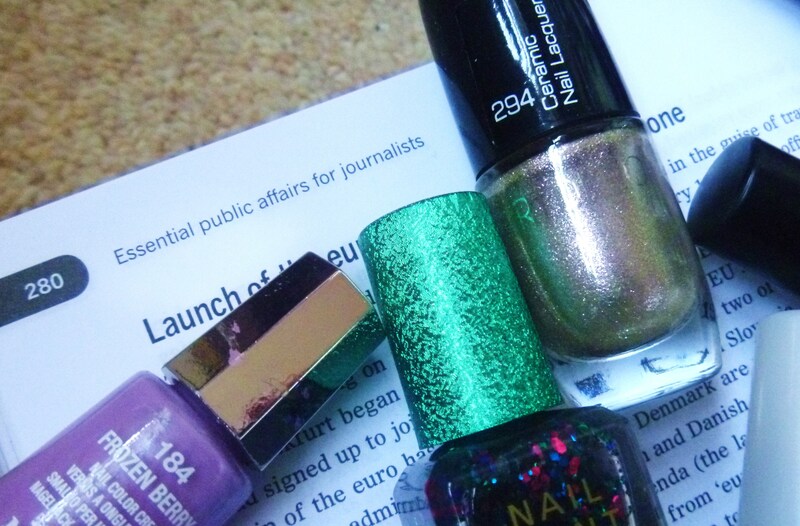 The Sarah’s style blog was extremely pleased to be invited to the Company Blog awards 2013, in partnership with New Look, as we were shortlisted for the best blogging duo! Deciding what we were going to wear took some thinking, we wanted to make sure we were dressed appropriately for the occasion while still feeling comfortable and expressing our personal styles. 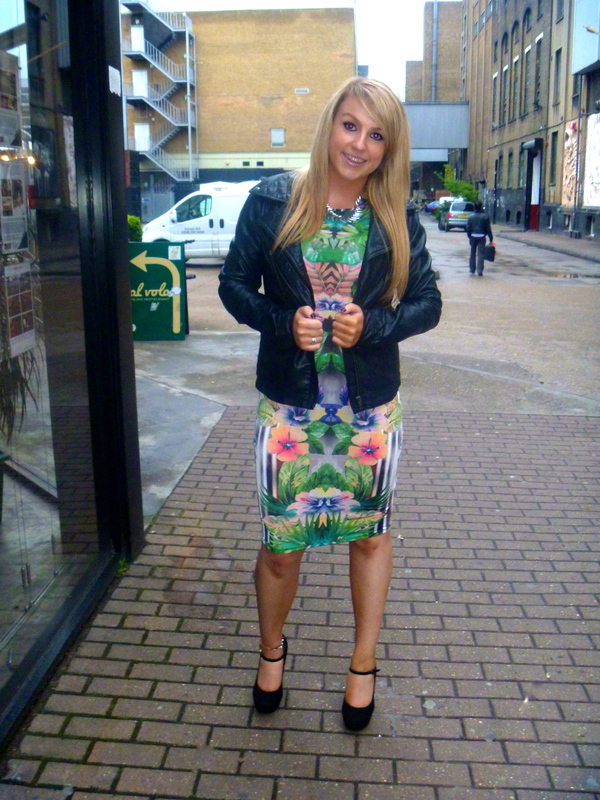 I took a trip to London… and yes you guessed it ended up in Topshop and was instanly attracted to a bright, heavily patterned, body-con mid dress. After trying it on I was sold. It was eye catching and fitted the description of my ideal outfit… as i’m sure many of you do, I get an idea of exactly what I want to buy before I even hit the shops. I teamed the dress with a leather jacket, from Red Herring, one so that I didn’t freeze and two because it gave a more edgy, less formal look. 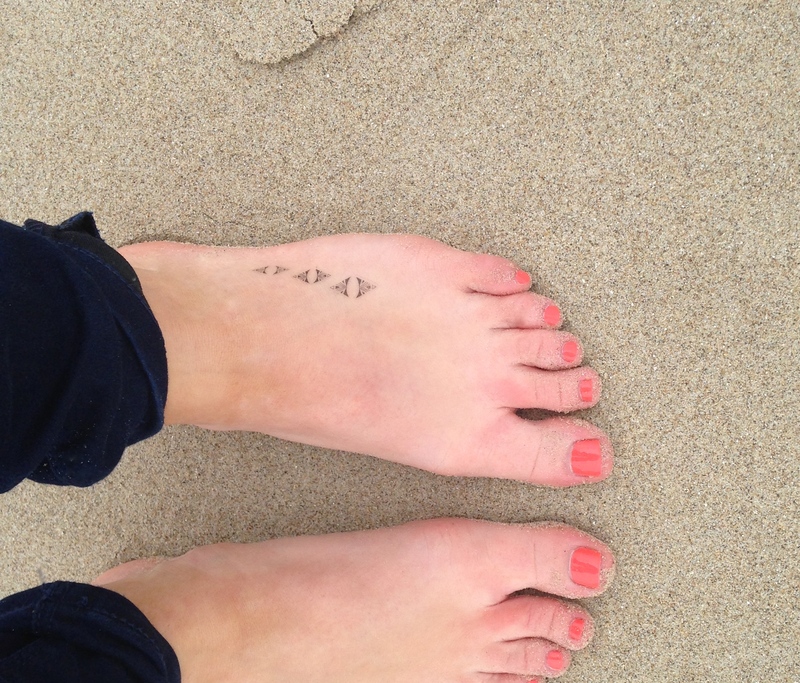 I wore a pair of simple, yet classic black wedges from New Look. I thought they would be comfy due to the wedge heel, but the platform is not large enough in my opinion to balance the height, but no pain no gain! Besides, I’m sure a pair of stilettos would have been more painful! 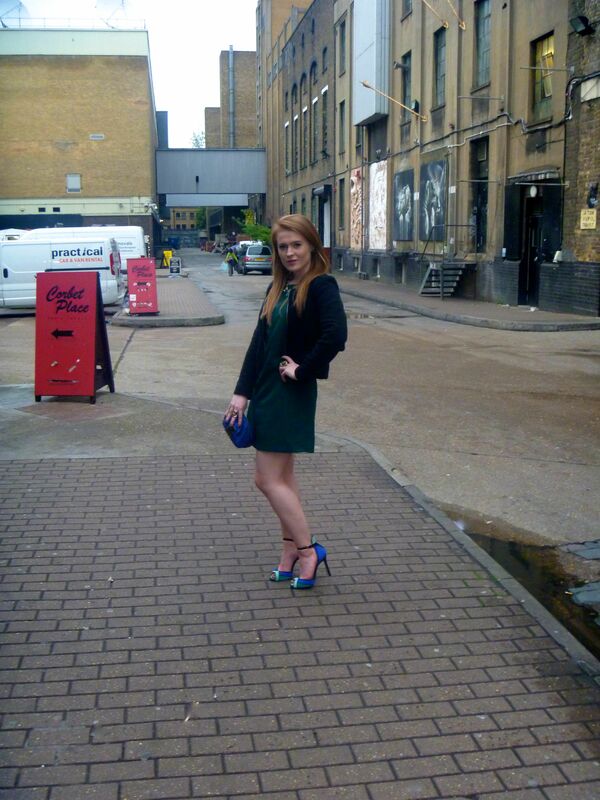 I decided to match my shoes and a clutch bag, as my dress added enough colour to my outfit. I chose a black silk clutch bag, purchased from New Look, complimented by a large bow on the front as it fitted all the essentials I needed. 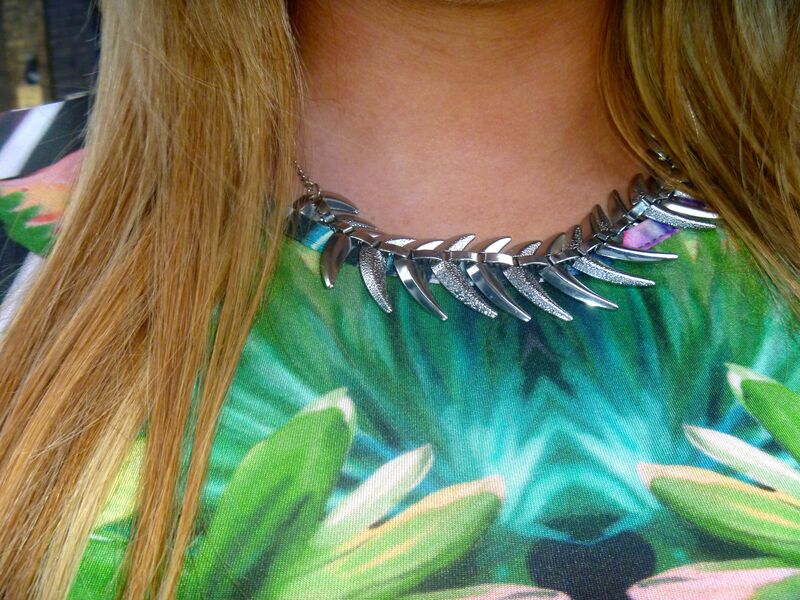 I then chose a silver necklace (also from New Look) which dressed up the outfit whilst not making it too over powering, as I was already in a fairly bold dress. 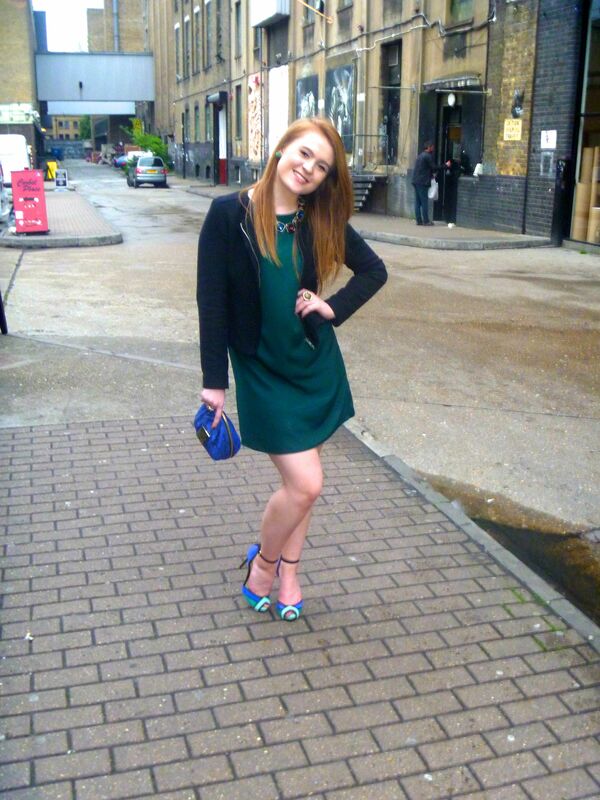 Sarah Redman opted for an emerald green tunic dress from Asos, which Sarah decied to dress up with accessories. Sarah (R) wore adventurous peep- toe, blue and aqua shoes from Zara, which she managed to walk in pretty well… Lets just say I was less quick on my feet! 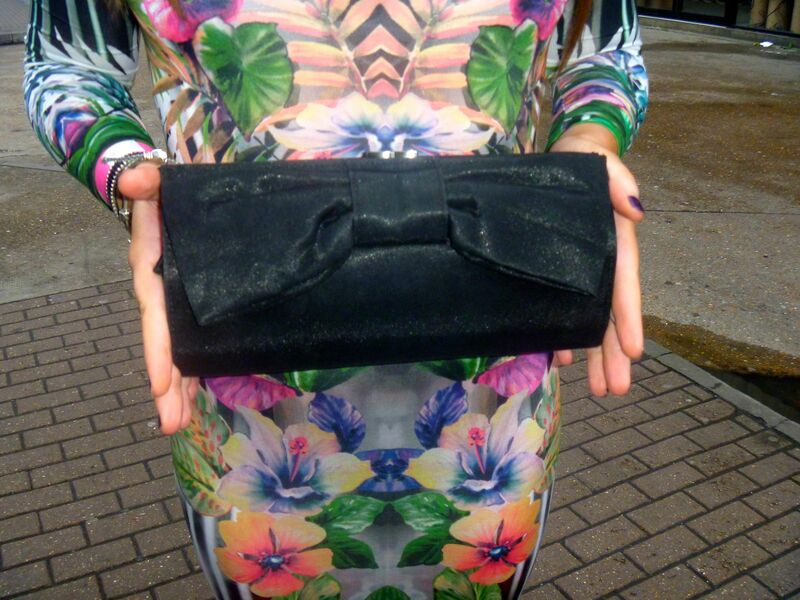 Sarah brightened up her outfit with her clutch bag, which also matched her shoes (great minds think alike!) 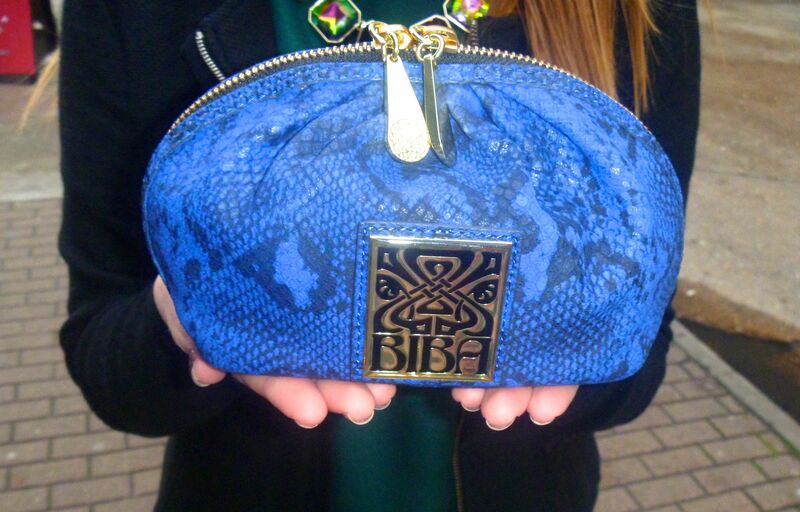 Her bag was from Biba, and do not be fooled, despite the clutch looking fairly small it was like a Mary Poppins moment. The amount of items that could fit within the bag was rather impressive, the material was fairly stretchy making it practical yet still stylish. Sarah teamed her dress with a classic black jacket from Miss Captain, giving a chic feel to her image. 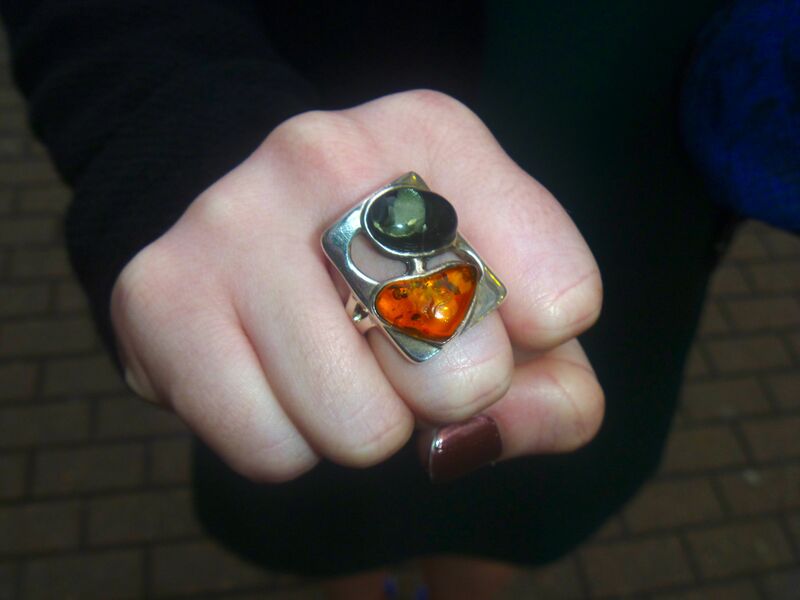 Sarah (R) never fails to wear a gorgeous ring, and for the blog awards there was no exception. 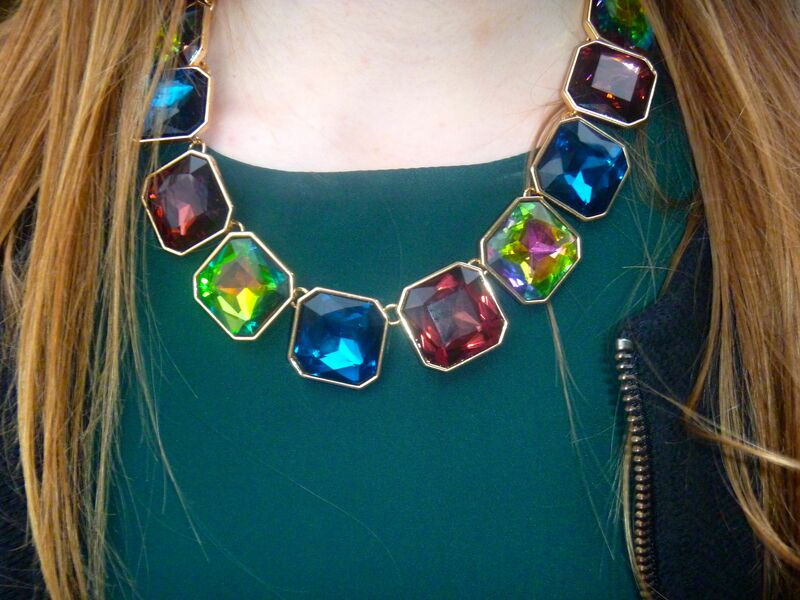 The emerald stone matched her dress, while the amber stone contrasted adding extra interest to her outfit, a birthday present bought from a small boutique in the Pantiles, Tunbridge Wells. The necklace Sarah (R) chose was another gem from Zara, the sapphire, ruby red and light green stones added texture and dressed up Sarah (R)’s dress, adding to her elegant look. The whole experience of attending the blog awards was great, we are extremely grateful to all those who voted for us, it was amazing to be selected out of thousands of other fellow bloggers! Besides, it gave us an excuse to buy a whole new outfit – the bank account may have had a shock but we certainly had smiles on our faces! 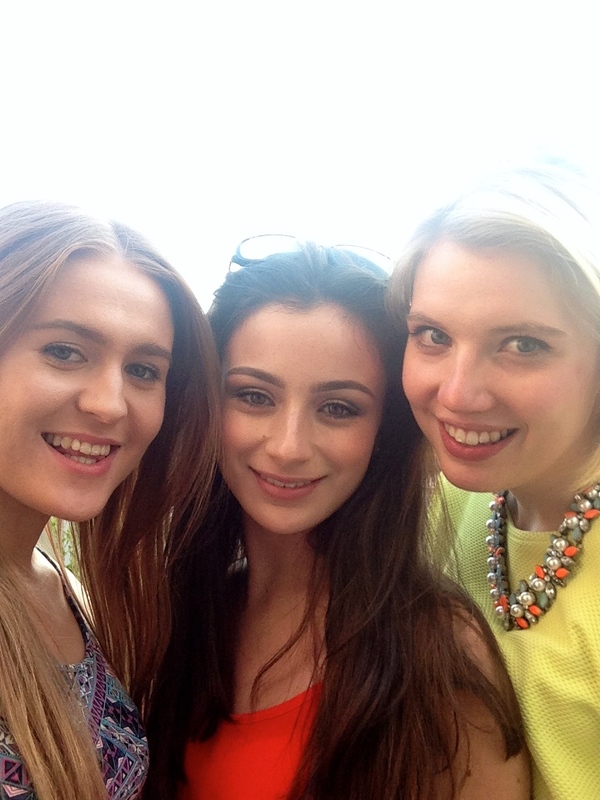 What do you think of the outfits we chose – would you have worn something different? Let us know @thesarahsblog or leave us a comment below. After a few days back working at the lovely Hoads and noticing my colleague Nicola’s style and lovely new purchases, I realised I have been neglecting my ever increasing collection of skirts. So today I have had a little rummage and found my new Primarny (Primark*) maxi skirt complete with thigh high split. Whilst I love rocking the coloured skinnys as much as the next girl, the sun is out, even if only momentarily… And hey you can always wear tights! *now on ASOS, combining the best of the online world with clothes a seven year old could afford to buy with their pocket money… Woop!